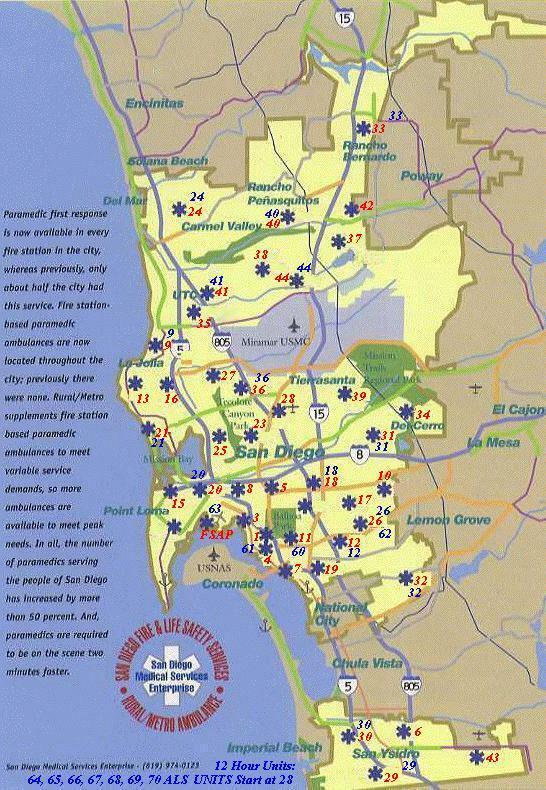 The static map below indicates all the Fire Satations and ambulance posts. Please note: recent changes to the system design and unit deployment have changed the configuration and location of some of the ambulance units. For more info, please send E-mail. Note: Station 44 and 37 remain under construction and Staion 2 and 46 remain in planning. F.S.A.P. The San Diego Lindbergh Field Fire Station is located at Lindbergh Field at the north end of Runway 27 / 9. 12 hour "PEAK LOAD" Paramedic Units: 64, 65, 66, 67, 68, 69 70 , are posted at Fire Station 28. Unit 71, 72 are speacialty units for events. Also, the BLS fleet is located at Station 28. Web page design and maintenance by Mitch Mendler E.M.T. Paramedic FireFighter;The WebMaster!